Die Martis, 22 Octobris, 1650. 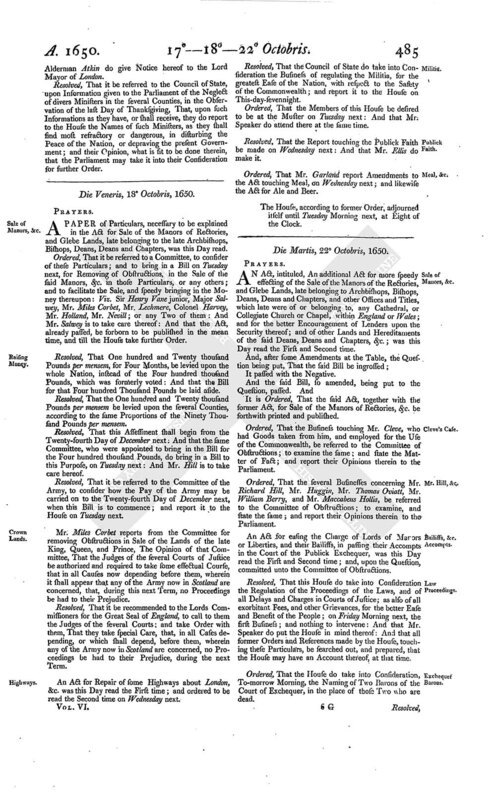 AN Act, intituled, An additional Act for more speedy effecting of the Sale of the Manors of the Rectories, and Glebe Lands, late belonging to Archbishops, Bishops, Deans, Deans and Chapters, and other Offices and Titles, which late were of or belonging to, any Cathedral, or Collegiate Church or Chapel, within England or Wales; and for the better Encouragement of Lenders upon the Security thereof; and of other Lands and Hereditaments of the said Deans, Deans and Chapters, &c.; was this Day read the First and Second time. It is Ordered, That the said Act, together with the former Act, for Sale of the Manors of Rectories, &c. be forthwith printed and published. Ordered, That the Business touching Mr. Cleve, who had Goods taken from him, and employed for the Use of the Commonwealth, be referred to the Committee of Obstructions; to examine the same; and state the Matter of Fact; and report their Opinions therein to the Parliament. Ordered, That the several Businesses concerning Mr. Richard Hill, Mr. Huggin, Mr. Thomas Oviatt, Mr. William Berry, and Mr. Maccabeus Hollis, be referred to the Committee of Obstructions; to examine, and state the same; and report their Opinions therein to the Parliament. An Act for easing the Charge of Lords of Manors or Liberties, and their Bailiffs, in passing their Accompts in the Court of the Publick Exchequer, was this Day read the First and Second time; and, upon the Question, committed unto the Committee of Obstructions. Resolved, That this House do take into Consideration the Regulation of the Proceedings of the Laws, and of all Delays and Charges in Courts of Justice; as also of all exorbitant Fees, and other Grievances, for the better Ease and Benefit of the People; on Friday Morning next, the first Business; and nothing to intervene: And that Mr. Speaker do put the House in mind thereof: And that all former Orders and References made by the House, touching these Particulars, be searched out, and prepared, that the House may have an Account thereof, at that time. Ordered, That the House do take into Consideration, To-morrow Morning, the Naming of Two Barons of the Court of Exchequer, in the place of those Two who are dead. Resolved, That the several Militias of the several Counties, or any Two of them, and such as they shall appoint, be authorized and required to tender the Engagement, in every Parish within their Jurisdictions; and take the Subscriptions thereunto; and return the Names of the Subscribers to the Lords Commissioners for the Great Seal: And that all Stewards, of the several Leets within England and Wales, be likewise enjoined to tender the Engagement, and take the Subscriptions, unto and of all Persons within their Leets; and to return the Names of such Persons unto the Committee of the Militia in that County, to be returned to the Lords Commissioners for the Great Seal. 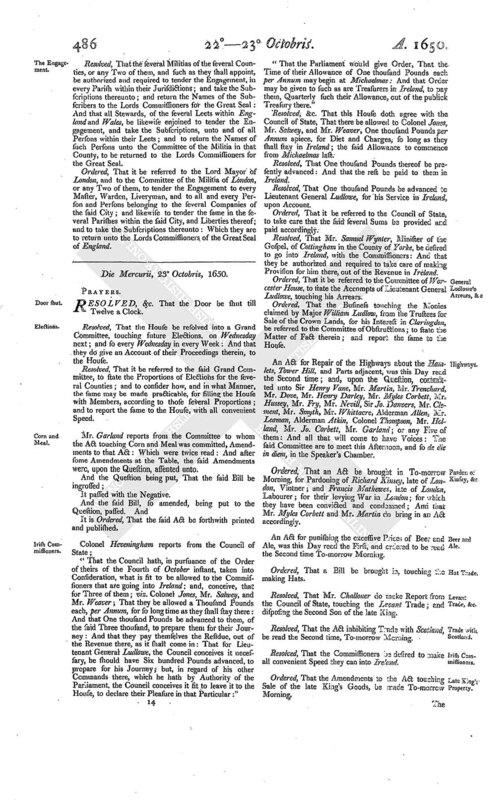 Ordered, That it be referred to the Lord Mayor of London, and to the Committee of the Militia of London, or any Two of them, to tender the Engagement to every Master, Warden, Liveryman, and to all and every Person and Persons belonging to the several Companies of the said City; and likewise to tender the same in the several Parishes within the said City, and Liberties thereof; and to take the Subscriptions thereunto: Which they are to return unto the Lords Commissioners of the Great Seal of England.